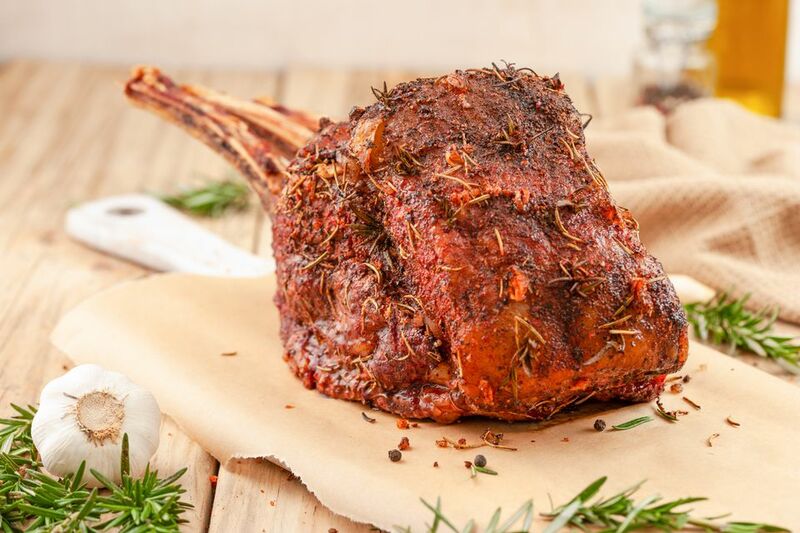 This is a classic prime rib recipe cooked on the grill. The secret is to keep the temperature low enough during cooking and to remove it immediately from the grill once done. Be sure to grill indirectly and also use a drip pan to catch those delicious drippings. Prepare grill for indirect grilling by placing a large dripping pan under where the roast will be. Make sure you know the weight of your prime rib. Plan on grilling indirectly for 12 to 14 minutes per pound. If you are using a smaller roast, adjust the ingredients and cooking times accordingly. Aim for a grill temperature around 375 F.
Periodically add water to the pan to keep the drippings from burning away if you want to make gravy. With a sharp paring knife make a series of 1/2-inch deep holes every 2 inches all over the roast. Insert the garlic slivers in every other hole and a leaf from the rosemary in the rest. Combine black pepper, dried rosemary, salt, and paprika and rub over the surface of the meat. When the grill is ready, place the roast on the well-oiled grate directly over the dripping pan. Cook for about 12 to 14 minutes per pound. An 18-pound roast will take about 3 1/2 to 4 hours. It is very important to use an accurate meat thermometer to check for doneness. You do not want to overcook this roast. When the meat reaches an internal temperature of 115 F to 125 F, remove it from the grill. Place it on a platter and cover loosely with foil. The meat will continue cooking and the internal temperature will continue to rise. Tent loosely with aluminium foil and let rest for at least 15 minutes, but no more than 30. Once the roast has rested, slice it and serve with your favorite sides. If you want the roast rare to medium-rare, remove from the grill when the temperature is 115 F and let it rest for 15 minutes. If you want it more well done, remove from the grill at 125 F and let it rest for 30 minutes. What's the Proper Timing When Grilling or Smoking Prime Rib?